"I have seen yesterday. I know tomorrow." This inscription in Tutankhamun's tomb summarizes The Fifth Beginning. Here, archaeologist Robert L. Kelly explains how the study of our cultural past can predict the future of humanity. 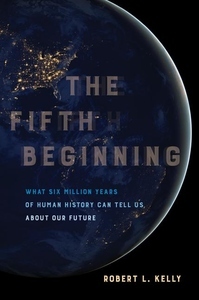 In an eminently readable style, Kelly identifies four key pivot points in the six-million-year history of human development: the emergence of technology, culture, agriculture, and the state. In each example, the author examines the long-term processes that resulted in a definitive, no-turning-back change for the organization of society. Kelly then looks ahead, giving us evidence for what he calls a fifth beginning, one that started about AD 1500. Some might call it "globalization," but the author places it in its larger context: a five-thousand-year arms race, capitalism's global reach, and the cultural effects of a worldwide communication network. Kelly predicts that the emergent phenomena of this fifth beginning will include the end of war as a viable way to resolve disputes, the end of capitalism as we know it, the widespread shift toward world citizenship, and the rise of forms of cooperation that will end the near-sacred status of nation-states. It's the end of life as we have known it. However, the author is cautiously optimistic: he dwells not on the coming chaos, but on humanity's great potential.